How do I change the IFrame settings? How do I remove the "smartEditor" link from "Administration" tab? Both smartEditor and ESRI Geoportal Server (http://www.esri.com/software/arcgis/geoportal and http://esri.github.io/geoportal-server/) have been modified to run with each other as two web applications. This means that you can use smartEditor as the primary metadata editor in Geoportal Server. This Guide was last tested with Esri Geoportal Server version 1.2.5. Basically Geoportal can call smartEditor sending the fileIdentifier of a specific document. Then smartEditor will request Geoportal for that document. After the user has finished editing the resource, smartEditor will return the document to the Geoportal Server via a CSW-T request (SOAP protocol). To ensure the user’s identity geoportal sends a SAML token to smartEditor application when invoking the edit procedure. smartEditor will also send this token back to geoportal when the user pushes the publish button. The token is being generated inside of the geoportal based on the current logged in user information. The SAML token will also be signed digitally to make it immutable. This document describes the configuration of Geoportal Server and smartEditor. smartEditor webapp directory will be referenced as $EDITOR_HOME in the next chapters. Geoportal Server webapp directory will be referenced as $GEOPORTAL_HOME in the next chapters. With [server] being the name of your http server running Geoportal Server. It is possible to switch the map widget inside of smartEditor between an OpenLayers based or an ArcGIS Server based implementation. 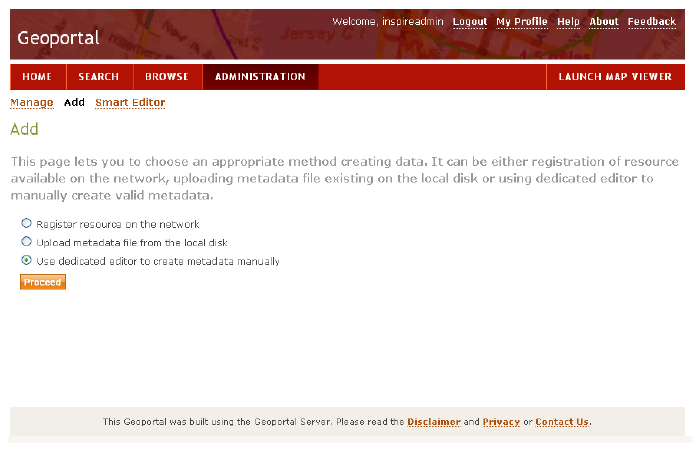 You can also use the OpenLayers-based map, see http://metadata.forum.52north.org/smartEditor-and-Esri-GPT-td4011971.html. As mentioned Geoportal Server got some programmatic extensions to interact with other web applications seamlessly. On the one hand this is con terra’s sdi.suite software but smartEditor as well. The smartEditor Adapter for Esri Geoportal Server project on GitHub contains all files for integration of smartEditor using the extension points provided by ESRI Geoportal Server. Stop your Servlet engine and copy the folder WEB-INF to $GEOPORTAL_HOME and make sure you have made a backup of your geoportal instance beforehand. Afterwards you need to open the file $GEOPORTAL_HOME\WEB-INF\classes\gpt\config\gpt-tc.xml and adjust some configuration values. Most of the values have xml comment strings it is just necessary to edit these parameters. sdisuite.enabled true keep value to "true"
"%JAVA_HOME%\bin\keytool" -genkey -keystore ".keystore" -storepass "changeit" -alias "gpt-security" -keypass "changeit" -keyalg RSA -validity 1800 -dname CN=security,OU=server,O=[company_name],C=EU"
Update [company_name] by setting your organization name. This command will generate a keystore file named “.keystore” having one certificate which alias named “gpt-security”. Both keystore and certificate have the password “changeit” set. Change these settings where necessary. Additionally make sure you have configured smartEditor’s parameters according to security correctly set, see file $EDITOR_HOME/WEB-INF/classes/application.properties and Installation Guide for smartEditor. The latter one is directly activated when applying all steps of integration. Replacing the existing editor means, having the smartEditor running within the Geoportal (IFrame based) without being capable of choosing the Geoportal Server internal metadata capability. The file /catalog/tc/smartEditor.jsp is already part of your geoportal distribution. Open the file $GEOPORTAL_HOME/catalog/tc/smartEditorBody.jsp in an editor and locate the IFrame-element (around line #66). Open the file $GEOPORTAL_HOME/catalog/skins/tiles/secondaryNavigation.jsp in an editor and locate following element (around line #109). Add html comment strings around this element and save the file. This value declares how the smart Editor window shall be opened when activated. 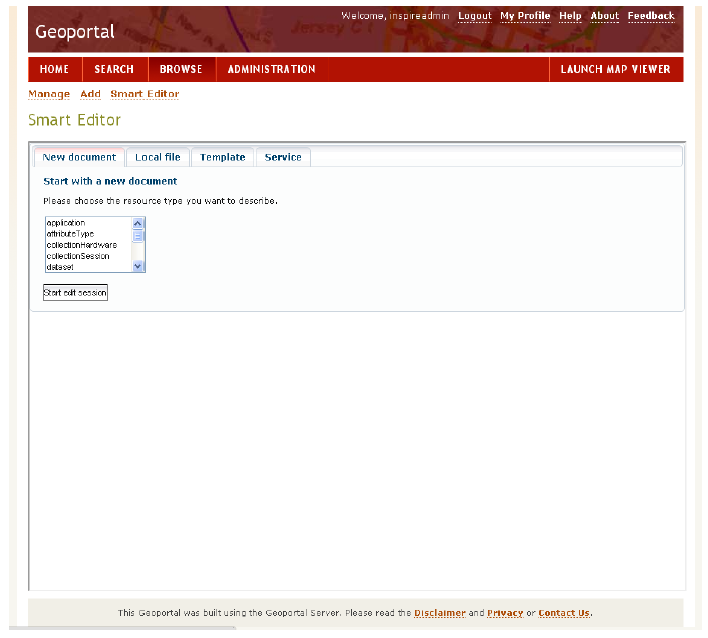 There is one known bug according the integration of smartEditor to ESRI Geoportal’s metadata management interface. The html form parameter name is wrong and needs to be adjusted. Open $GEOPORTAL_HOME/catalog/publication/manageMetadataBody.jsp in an editor and replace all occurrences of string “samlTicket” by “ticket” (should occur twice). The SAML issue must not be fixed anymore. The integration type must be set to „iframe“ so that the button appears in the menu.